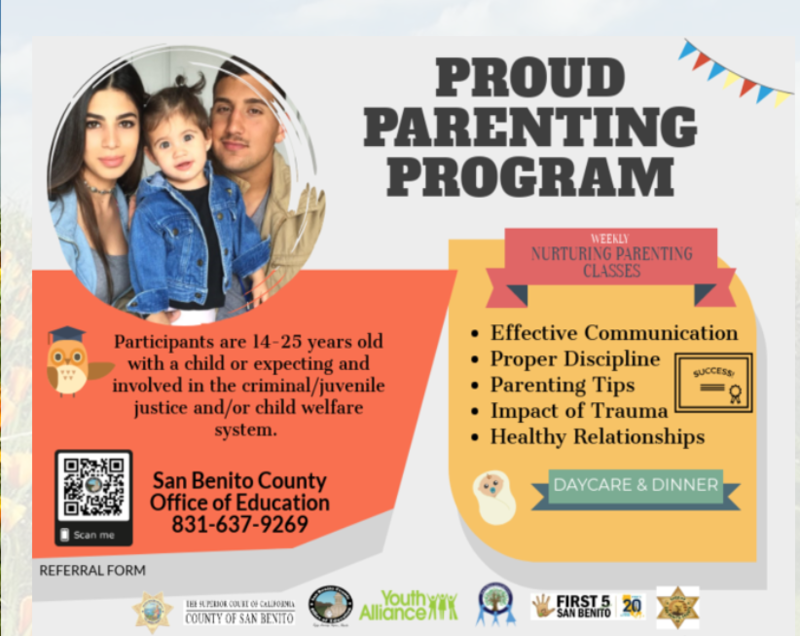 Youth Alliance, in partnership with the San Benito County Office of Education is excited to offer the Proud Parenting Program in San Benito County. Funded through a grant from the Board of State and Community Corrections (BSCC), the program is available to young or expectant parents, ages 14-25, who have been or are currently involved in the criminal justice, juvenile justice and/or child welfare system. This class teaches positive parenting tools that increase self-worth and respect. Lessons promote discipline that provide dignity and understanding. Participants increase knowledge on mental health issues and focus on personal development. Families with at least one parent between the ages of 14 – 25. Please see the special requirement below. Don’t hesitate to contact us if you think you might qualify/benefit from enrolling in class. Family member needs to have past or current family involvement in the justice system OR family intervention services (CPS, Foster Care, etc). Class meets once a week for 13 weeks. Each session is 2 ½ – 3 hours long. Family-style dinner and childcare are provided weekly. For more information, please contact Youth Alliance at 831.636.2853.